Can I keep garden soil that once had grubs in it? Client's Request: Can I keep and/or reuse garden soil that once had grubs in it? I've been picking them out of the soil when I find them and leaving for the birds to eat them. MGCC's Help Desk Response: Thank you for contacting the UC Master Gardener Program's Help Desk about the grubs in your planters. Grubs are primarily pests of lawn grass, preferring turf grass roots to other plants. While they will feed on other plants' roots, they typically are not a big problem in planters. It's not unusual to find grubs in your soil in the winter. The larvae overwinter in the soil, and emerge in late spring and summer. Your picking them out of the soil and leaving them on top for the birds was exactly the right thing to do. You don't need to discard the soil. Most gardens can tolerate some grubs in the soil, unless the population becomes very high. 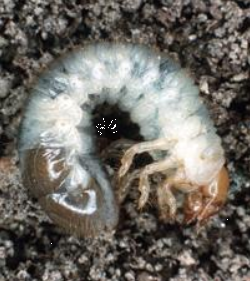 For more information about grubs in a vegetable garden MGCC Help Desk covered previously, follow this link: https://ucanr.edu/blogs/blogcore/postdetail.cfm?postnum=25191. Included in that link is another link to using beneficial nematodes to control grubs if you find you continue to have problems. Happy gardening! Please contact us again if you have more questions. Note: UC Master Gardeners Program of Contra Costa's Help Desk is available almost year-round to answer your gardening questions. Except for a few holidays (e.g., last 2 weeks December), we're open every week, Monday through Thursday for walk-ins from 9:00 am to Noon at 2380 Bisso Lane, Concord, CA 94520. We can also be reached via telephone: (925) 608-6683, email: ccmg@ucanr.edu, or on the web at http://ccmg.ucanr.edu/Ask_Us/. MGCC Blogs can be found at http://ccmg.ucanr.edu/HortCoCo/ You can also subscribe to the Blog.